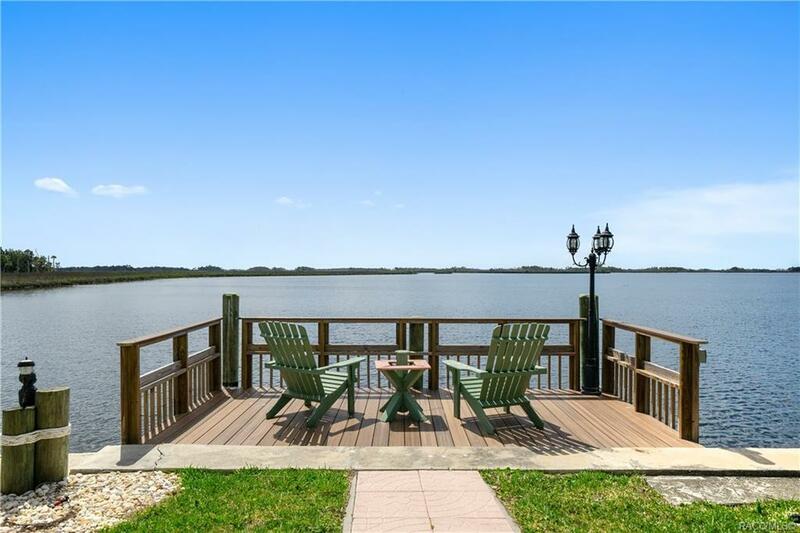 Breathtaking open waterfront view leaves you wondering where the water ends and Heaven begins. Unique 3/3/3 pool home w/ 2420 living area nestled in desirable Dixie Shores with direct access to the Gulf of Mexico. Interior boasts two master suites, a gourmet kitchen w/ granite cabinets, white wood cabinets & breakfast bar, spacious formal dining, family room w/ wood fireplace, living room with panoramic views of unsurpassed Dixie Bay, sunroom and split floor plan. Exterior features a lush 1/2 acre parcel to gaze upon state protected waterways as far as the eye can see, covered boat house w/ lift & walk around dock, 2 additional docks, heated pool, screened & covered lanai w/ gorgeous koi pond, private sun deck, serene courtyard area, 8x10 workshop & side entry garage. Home is topped with a FREE One year home warranty. Ask agent for a list of upgrades & schedule a private tour today! Directions: 19 South To Right On Ft Island Trail To Left On Dixie Shores Dr To Right On Bayshore Dr To Home On Left.